The American Eskimo Dog is very intelligent, slightly conservative, but friendly and always alert. In it's home it is an excellent watchdog, sounding a warning bark to announce someone is coming. If you do not like a dog that barks this is not the breed for you, ( this is their job). It is protective of it's home and family members, although it does not threaten to bite anyone. The American Eskimo Dog is very eager to please and learns very quickly. 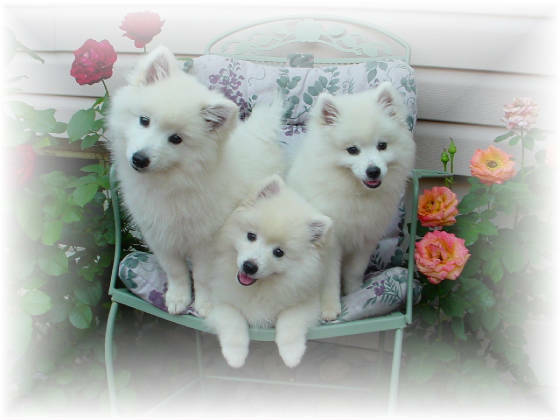 There are three sizes of the American Eskimo Dog, Toy/ Miniature/ Standard. Toy- 9 inches to and including 12 inches; Miniature- over 12 inches to and including 15 inches; and Standard- over 15 inches to and including 19 inches. Here at Cherub's we are a small breeder of Miniature & Toy American Eskimo Dogs. We don't breed too often, but we can help you find a reputable breeder. All of our dogs are in tip top shape and Optigen tested. They live in our house as family members and are well socialized. We go to AKC/UKC shows for fun and to keep our breeding program up to the standards. All our puppies go through the Early Stimulation Program http://tervueren.com/cachetnoir/EarlyStimulationPuppyProgram.htm and do not leave here until they at 10weeks old. They come with a 1yr. health guarantee and contract that states for any reason you cannot keep this puppy it must come back to the breeder for future placement. I screen my puppy buyers thoroughly and do home checks. I have a questionnaire to be filled out to help me place the puppy that has the personality that best fits the family and also helps me to pick a good stable forever home for him/her. 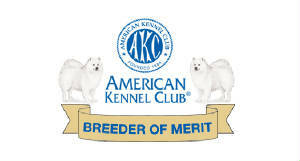 If the puppy is not going to be shown in conformation (show ring) the puppy MUST be spayed/neutered before the first heat cycle in order to receive your AKC/UKC papers. I DO NOT ship my puppies. I feel it is important for you to meet the puppies parents and us to get to know each other a bit more as I will be here to answer any questions and give you guidance throughout the puppies life. 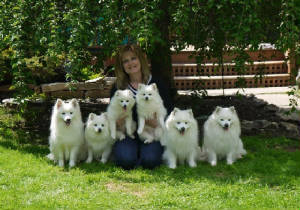 I am a member of the American Eskimo Dog Club Of America http://www.aedca.org/ and on the Board of the American Eskimo Dog Fanciers Of Greater Philadelphia, my husband Todd is the President. "Looking For An Eskie?" She took the words right out of my mouth and described what it is like at my house with my eskies and many other eskie families. 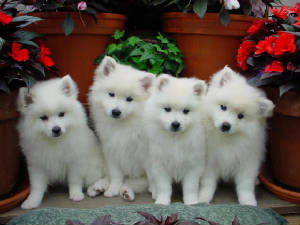 If you are new to the breed it will help you get a vision of what an eskie is all about and if it is the breed for you. If you're looking to add a 'dog' to your family, Eskies are probably not the breed for you. If you're looking to add a 'kid' to your family, THEN you've got the right breed. They're SUPER smart...and more than exercise, they need mental stimulation. They love to be 'busy' doing something that involves thinking. They love to play, go for walks, and do ANYTHING as long as they're with their 'family'. Most are like velcro balls on your socks...I walk around here with a little 'parade' trailing behind me. I call them my 'Visa' Eskies...everywhere I want to be. Eskies are like lays potato chips...you can't just have one...they're much too much fun...these Girls are always doing something to crack me up. They do need to get out and be socialized, as puppies, and throughout their lives. Eskies are people magnets, you'll meet more folks through an Eskie, cuz they're just so beautiful people come over to meet them, and by keeping them around people other than their family, they will be well adjusted little ambassadors. They do very well in obedience classes and are especially THRILLED when they make you happy. They are very good watch dogs, and will become very protective of house and home and their family, so you MUST keep them socialized. You can never be harsh in disciplining an Eskie because they will NEVER forget. Fair but firm...they need a leader and are very happy when they have a leader (you), but will step right up and try to fill the leadership role, and run the house. Once you fall in love with an Eskie, there will never be another breed for you! Can you tell I am hooked? NOTE: 2011 PetPrints calendar, features my home bred "Prayer Bear" on the front cover and his daddy "Breezer" for the month of Sept. Breezer is also featured in the 2010 PetPrints calendar for the month of Feb. Again, those photos are captured by Jeannie Harrison. Jeannie does wonderful work. I must add that she is one of the nicest persons I have ever met. Very pleasant and patient with all during her photo shoots.